Något känt om mobiloperatören Gunnar Eriksson ? Anything known about wireless operator Gunnar Eriksson? 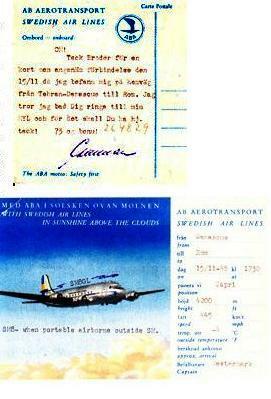 It is very probable that the Swedish DC-3 was Swedish Airlines (AB Aerotransport, ABA) SE-BAW "Svanen" (The Swan). A Swedish Missionaries organization (Scandinavian Missionary Flights, SMF) had chartered it from ABA. Captain was Carl Gustaf von Rosen. An ABA "Felix B-17" visited Addis Abbeba in December 1945. ABA had hopes to assist in setting upp an Etiopian airline. Also later flights were made. It seems that SMF made the first African flight with their own DC-3 SE-APG "Ansgar" only in early March 1946. So I think it had to be SE-BAW Svanen you saw 29 January 1946 even if ABA had some further DC-3 to use. 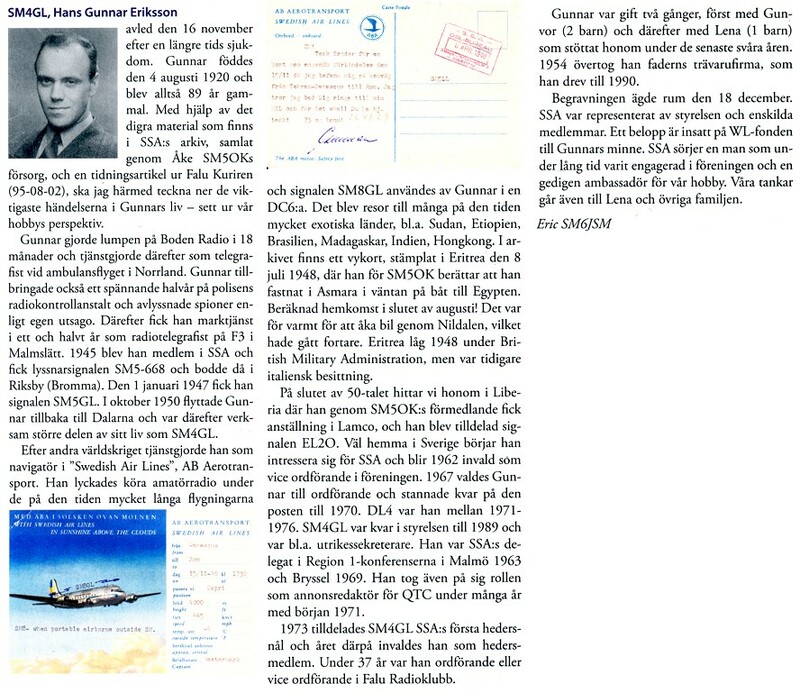 So much of the stuff I referred to is in Swedish, but I was able to find the Gunnar Eriksson obituary in digital form (in a SSA paper) and then used the Google translation service to turn it into English. English-speaking Swedes understand what Google is trying to say when it sounds "silly" and I hope those not knowing Swedish still can make out what it is about. Thank you very much for all of that interesting information! I do have the book by Jan Forsgren, and am often in touch with him. Great to hear about what Gunnar did - he was a friend of my father while he was with the RAF in Addis, and must have been responsible for getting him two "flips" (flights/joyrides) in SE-BAH, and probably SE-BAW. Although my father does not mention von Rosen in his diaries, he must have met him briefly on those two test flights. Left Bromma (Stockholm) on the 4th December 1945, to Naples (1,287 miles), to Cairo (1,208 miles) and to Addis Ababa (1,525 miles; total: 4,020 miles); returning by same route on the 10th. Cruising at around 180 miles per hour, would have been about 23 hours flying time each way. von Rosen is mentioned in connection to this trip; he was a pilot with ABA at this time, and http://www.flyghistoria.org/kronologi/1940_1949.pdf has: "...1945, Dec.1: Carl Gustaf von Rosen hired by the Ethiopian emperor as "Principal Instructor and Director of the Imperial Air Force. " CFV approved the Swedish personnel were made available to build Ethiopian Air Force. Swedish involvement ceased in early 1961..."
"...When von Rosen in mid-November 1945 landed in Addis Abeba on his way to Madagascar and, together with SILA's chief economist Ture Bielkegård, discussed the project of an Ethiopian Airline with the Emperor, nothing was revealed about the (already signed) contract with TWA. The American Legation, however, immediately reported to Washington about von Rosen's and Bielkegård's visit. Bielkegård was reported to carry a passport as a missionary, whereas the real purpose of his coming to Addis Abeba, was to investigate the possibilities of establishing an internal airline in Ethiopia. According to Herrmanns (von Rosen's biographer), von Rosen was informed about the contract with TWA in early December 1945, when he again landed in Addis Abeba hoping to sign a contract for an Ethiopian Airline. The Emperor instead offered von Rosen a position as 'Principal Instructor and Director of the Imperial Ethiopian Air Force' as from 1st December 1945 (backdated; as he left Stockholm on the 4th), for a period of three years. He was to start with a flying school, mainly along the plans he had outlined together with Bielkegård..."
I've trawled through the Archives of the Arlanda Civil Aircraft Collection, and they keep the flight logs for SE-BAK, -BAM, -BAN and -BAO. Unfortunately, it would appear that the flight logs for -BAH have gone awol at some point. This was the inaugural flight between Bromma and Bishoftu made by SILA. According to the Swedish newspaper Dagens Nyheter, SE-BAH left Bromma on Tuesday 4 December at 0700 hours. Aboard were the crew (only the first pilot, Carl Gustaf von Rosen and the wireless operator G. Eriksson, are mentioned) and 22 passengers. The first intermediary landing, at Naples, occured at 1538 hours, and take-off at 1717 hours. The estimated time of arrival in Cairo was at 2320 hours, 40 minutes ahead of schedule. The Fortress finally arrived in Addis on Thursday 6 December, landing at 1400 hours. The Emperor is said to have been at the airport, "incognito", welcoming the crew and passengers to Ethiopia. According to a United Press telegram printed in the Friday 7 December issue, p. 1, "Colonel Tamm has been delayed and is not expected until Friday. (Viking Tamm was to take charge of the training of the Imperial Bodyguard.) The other Swedish travellers have happily and finally arrived. At 1400, the rebuilt Flying Fortress with doctors, missionaries and nurses aboard, landed. The personnel will take charge of the Betsaida Hospital, which prior to the Italian invasion was managed by the Swedish doctor (Elias) Hanner. The trip from Sweden has been a brilliant success, without any disturbances or incidents, according to the passengers. On Tuesday, a day's rest was made in Cairo in order to assist with acclimatization. The landing at Addis Abeba airfield went perfectly, with large crowds having gathered to welcome the arrival of the aeroplane. The Ethiopians especially warmly welcomed Sister Vera, one of Dr. Hanner's original staff." SE-BAH left Addis late in the evening on Sunday 9 December. Only three passengers were aboard, Mrs. Kjerstin Guntenberg and her two sons Ulf and Björn, with the Norwegian engineer, Mr. Tjomsaas, joining in Cairo. They arrived safely at Bromma airport on Tuesday 11 December. Flying certainly had more charm and adventurous spirit than nowadays! I will check for further details on this particular flight between Sweden and Ethiopia. Tues 11th Dec 1945 - Bromma. Now I better understand your interest in details from 70 years ago from a very far away place! Is a DC-4 shown or a DC-6? Note the Swedish colours on the rudder as used in the pre-SAS days. SE-BAW Svanen, left Bromma on the 11th November 1945, and arrived on the 16th November. SE-BAH Sam, left Bromma on the 4th December and arrived on the 6th. SE-BAW Svanen, (most probably, as that was the aircraft that was chartered!) was in Addis on the 29th January 1946, arriving before that date - (probably leaving Bromma 22nd or 23rd, see below). I will ask Jan if he can find the flight logs for SE-BAW! Senast redigerad av Peter Maxfield 06 dec 2015, 03:10, redigerad totalt 1 gång. A very valuable listening of the SE-BAW's flights! November 16th: This has been a great day. A new era in our mission history has started. Almost to the minute as given a week ago from Stockholm as arrival time, SE-BAW landed at the Addis Ababa airport. After landing the plane came nicely rolling up to the main entrance. The plane brought a new flag: "Nordiska Missionsflyg". First to disembark was the pilot, Count von Rosen, and then came his three man crew and then the passengers of the plane. Among the latter were Stjärne, Ruth Perman etc. Ten of the passengers were Norwegian missionaries bound for Madagascar. Most of them could stay <overnight> with us at Entotto. The plane set off from Malmö early in the morning and probably he managed to reach Cairo in Egypt on the same day or just a few minutes into the next day. No such flight has taken place before. It was a joy that the first missionary flight could set this record. The travellers had their breakfast in Malmö, dinner in Athens and supper in Cairo. But the speed is also as high as about 300 km per hour. In other words, it's the same as going from Skåne to Stockholm in two hours." Air travel meant a lot in those days ! Besides von Rosen the initial group of Swedes belonging to the IEAF unit consisted of 19 persons, who left Sweden between January 9 and 16 July 1946. 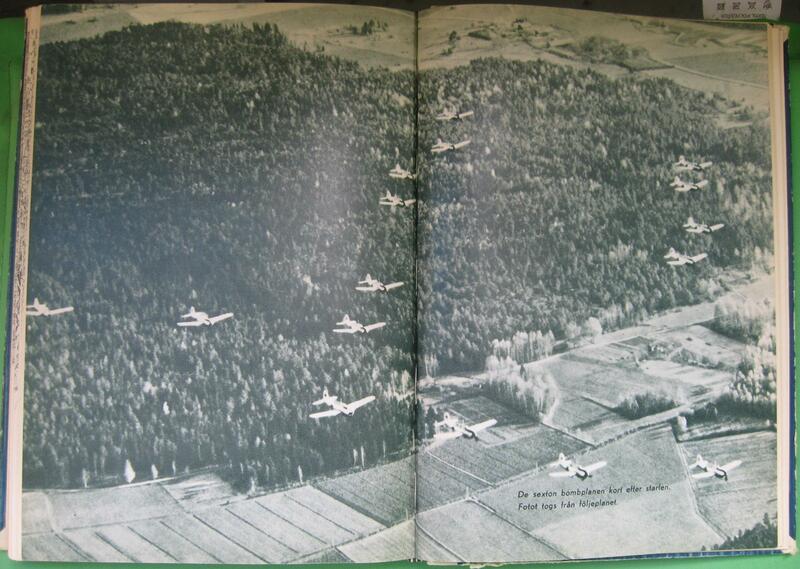 The group comprised three Air Force pilots, six mechanics, three wireless operaters and one meteorologist, all but two of the mechanics being recruited from the F 1 air base in Västerås. There were also three engineers, one of whom was a construction engineer to build airfields, one secretary, one hotel manager, and one accountant. Carl Gustaf von Rosen transported Swedish experts to Ethiopia every two weeks during most of 1946...The Swedish Charge d'Affaires said that a Swedish plane would make a number of trips to bring remaining Swedish doctors, teachers and nurses to Addis Ababa, but that these trips would not be on a commercial basis. The pilot of the plane, von Rosen, would eventually remain in Ethiopia as an aviation instructor. http://www.diva-portal.org/smash/get/di ... TEXT01.pdf Page 210. Thank you Peter for this information and the reference to the study on the Swedish-Ethiopian earlier contacts by Viveca Halldin Norberg. There have been plenty of contacts between the two countries, not only related to Christian missionaries and military staff. Carl Gustaf von Rosen was by some seen as ”a sort of heroic person”, with an ability to succeed in getting unusual things done and also following an ”idealistic conscience” more than ”normal wisdom”. A bit like his younger sister, Birgitta Wolf, who was well known in Germany for charity work. I think it has to do with their upbringing. For us interested in flying Carl Gustaf was well known. For my blog I have through the years scanned some pictures and text that reflect this. It seems that Mrs Halldin Norberg does not treat the catastrophe 18 November 1947, when the crews that had delivered ”surplus” Saab B 17single-engine bombers to Ethiopia almost all perished when the Bristol Freighter carrying them back to Sweden crashed into a mountain near Salerno in southern Italy. Many articles have been written on this accident and the memories of the inhabitants of the Italian village Scala, and also documentary films have been made. In January 2016 a further film will be shown in Swedish television (SVT2 on 21 January; I might not be available via Internet outside Sweden). In a journal of Swedish-Ethiopian Association the visit to Ethiopia of the director of the documentary, Birgitta Hald-Svensson, is reported. http://svensk-etiopiska.se/images/stori ... 5_webb.pdf (page 16 and following). Maybe you may recognize some of the pictures in the journal. Lars - The Ethiopians in the magazine photo with von Rosen getting his award (in one of your links), are, from Left to Right: Gadissa Guma, Getachew Kenfere, Merkorios Haile, Mikael Sahilemariam and Mitku Muleta. Best wishes, Pete. I do not know much about Ethiopia and the political turmoil, but I think that a few years ago a diplomat became a refugee or suchlike here. Maybe there could be "Air Force ties" for some (elderly) Etiophians living in Sweden. 1/ SE-BAW 'Svanen', left Bromma on the 11th November 1945, and arrived Addis Ababa (Lideta) on the 16th November at 18:15, just before dark. Heli says 10th-29th November, Bromma to Madagascar with stops at Addis each way. My father's diaries have this entry for Friday, the 16th November 1945: "...Spent most of the afternoon chatting with the Radio Officer of the Swedish D/C which arrived yesterday - an indication that BMME will be on its way before long..." BMME= The British Military Mission to Ethiopia; Gunnar Eriksson was the Radio Officer; Heli has the take-off on the 10th, not the 11th, and my father says it landed in Addis on the 15th, not the 16th. The Swedish crew stayed at The Duke Hotel in Addis Ababa. Tues 4th Dec 1945 - Bromma 0700 - Naples 1538, Naples 1717 - Cairo 2320. Weds 5th Dec 1945 - Rest Day. Thurs 6th Dec 1945 - Cairo - Addis Ababa 1400. Sat 8th Dec 1945 - 37 minute morning test flight (including RAF Sergeants: Peter Maxfield, Johnny Wakefield and George Kay). Sun 9th Dec 1945 - Addis late evening - Cairo. SE-BAH was halfway between two liveries at this time. Photos show that the 1944/45 olive green camouflage has been begun to be stripped off. The tail, dorsal fin and upper wing surfaces are bare metal (with new black registration lettering), while the main fuselage is still green with the standard yellow writing. Half and half on the engines - the outboard two, have the natural metal and three stripes (blue, or possibly red) on the propeller tips of the 1946/47 livery, while the inboard pair have the earlier style propellers still in matt black with the yellow tips. The paint is well worn and chipped, especially on the nose, and on a vertical line adjacent to the No.3, starboard inner propeller - it must have been blowing grit and dust at the fuselage. The previous assumption that SE-BAO was unique in having a half and half livery is therefore not correct - presumably all five of the Felix class would have been stripped in the same way, probably (guessing) due to the use of scaffolding to reach the top of the vertical stabiliser, and without taking them out of service while this was done. 3/ The SE-BAW flight (1945-12-12 Långflygning Bromma-Torslanda-Schipol-Lyon-Marseille-Neapel-Atén-Kairo-Addis Abeba-Madagaskar (45-12-16), fpl chartrat av Nordiskt Missionsflyg, ff C von Rosen) left the very next day after von Rosen got back flying SE-BAH. Heli says the pilot on this flight (12th) was a Captain Stephenson, not Carl Gustaf von Rosen, and that the dates were 12th-22nd December. 4/ SE-BAW Svanen, was in Addis on the 29th January 1946, arriving before that date - (probably leaving Bromma 22nd or 23rd). Heli also says that von Rosen took his family to Ethiopia in March 1946. One of my father's photos shows three (and a half) men in front of a DC-3. One I recognise as his friend 'Dixie' Dean wearing a battledress jacket. The two next to him are in smarter uniform. Without any details written on the back, I'd always presumed them to be visiting RAF. However, I can't think that many RAF DC-3's had curtains in the windows, and now having a photo to compare it with, I think the man in the middle is Gunnar, with another member of the crew in front of 'Svanen'! It may be of a general interest even if it (the thread itself) does not give details of ABA flights to/from Ethiopia. 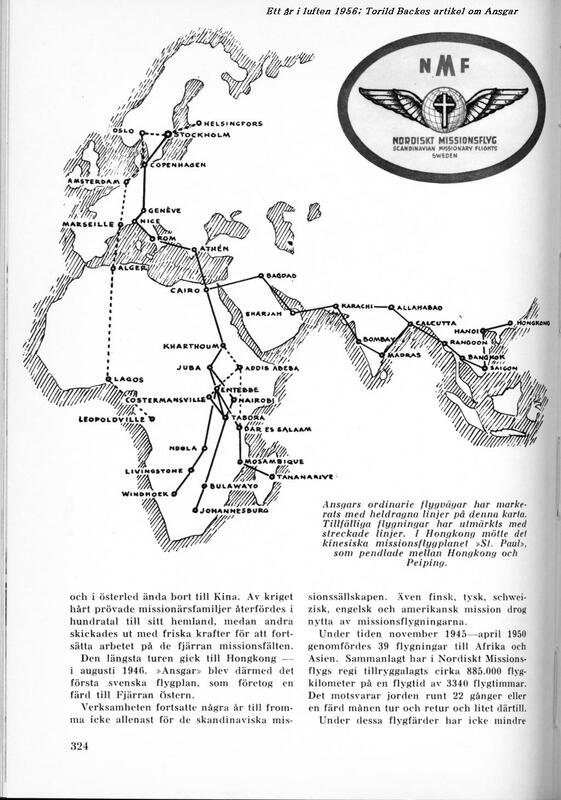 A somewhat free translation of the first item: "In 1945 Hägglund & Söner" (a company located in Örnsköldsvik in northern Sweden, building coaches for railway and roads and also other products), was asked to build road coaches in Ethiopia. Erik Hägglund together with a handful of coach builders went there. One of them was Ossian Johansson, today 96 years. In his book "Mitt Backsjö" he tells about the flight to Ethiopia and the hardships there. Some of these stories stories can be read on the website of the Söderhamn town, however, the flight with SE-BAH is not included there. Ossian also had taken part in the welding of the steel tube fuselages of the J 22 fighter planes at Hägglunds." Ossian also worked as instructor in a vocational school for metal industry workers in Ethiopa for some time before he went back home in 1948 by various means, e g a DC-3, bus and railway in Africa, a ship in a very bad condition across the Mediterranean (nothing is new...) and railway through Europe. I guess it makes interesting reading from the situation in Europe and the turbulent east Mediterranean area the years immediately after the war. He is very good in describing his experiences, so it seems from what I have taken at glance at. It is easy to find these stories through googling if you know Swedish, also to find libraries from which his book "Mitt Backsjö" can be borrowed. May we hope that somebody reads it and tells us of any details that can be found on the SE-BAH flight? P S 16-04-27: Within a few days, I expect to have the book "Mitt Backsjö" on loan via my local library. Apologies - I have been distracted for rather a long time, and haven't visited the Forum for ages. I did follow your link and saw the photo of Safir (106) in Ethiopia. Any details or date for that? Guessing it's at Bischoftu (Debre Zeit)? SE-BAH. They are in the family collection, so I would have to get her permission before posting any - I will ask! They are high-definition of the converted fortress, and show her in half wartime, and half postwar liveries (as does my father's blurred image from the same visit to Addis in December 1945) - the paint work was obviously in progress when she flew from Bromma. It's most noticeable on the propeller blades, with one of each type on both port and starboard sides. Apologies again for not seeing your last reply for so long! Is there a notification button that I can 'click' to alert me by email to any replies? Best wishes to you, and all on the Forum! Is Ossian Johansson still with us? Now 98? I will reply to your mail later. I searched for Ossian and saw that he passed away 3 weeks ago, leaving a widow. He was born 28 February 1920 and passed away on 10 January 2018. As far as I know, there is no way of indicating that somebydy is reacting on your input on the forum. 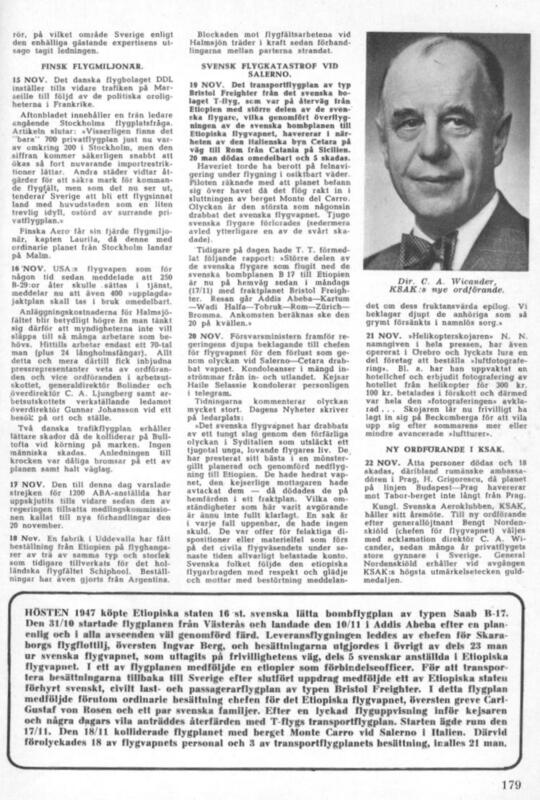 Much could be find in the newspaper, Etiopa was country where Sweden had many interests. Some details: loads were bananas and fruits nobody knew the names of, flying a Boeing B-17 over the Alps at 7000 m with passengers, even if they were only four of them, a difficult landing in Naples and so on. The Etiopian ground crew and Kilamanjaro pictures stem from the previous flight to Madagascar, made by SE-BAW (ABA DC-3 ex C-53). Senast redigerad av Lars Sundin 01 feb 2018, 16:08, redigerad totalt 2 gånger. Don't know if this has been mentioned here yet, but one of the mechanics, Göran Hedqvist, who worked with von Rosen in Ethiopia, is still with us. He's 91 and obviously in good health - actually was at F 18 Tullinge just a couple of days ago and held a talk about his time in Ethiopia. This told by a good friend who was there. Dear Lars and Hans, and all Forum members! - I keep re-reading sections as it's such an amazing story. What a life! On Monday, the Swedish Mission Flight returned from its second trip to Ethiopia. The pilot both times, has been Flight Captain C.G. von Rosen, who also put the above unique photograph at the disposal of Svenska Dagbladet. It's an aerial photo of Addis Ababa, probably the first in the Swedish press, taken from the cockpit of the Swedish plane. Even if the houses seem low, the streets are wide and straight, giving a modern look to the city. Read about the remarkable journey to Ethiopia of the Swedish aircraft 'Sam', and the magnificent reception they got, on page 13. Two more of Captain von Rosen’s pictures from Ethiopia: on top, four black mechanics from the airport at Addis Ababa, and below them the highest mountain in Africa, Kilimanjaro, 6,010 metres above sea-level, photographed from the Swedish aircraft, whose wing can be seen in the lower left corner. A beautiful hand- knotted carpet was presented by the Ethiopian Emperor as a gift to the Swedish air companies ABA and SILA. The present was found amongst the cargo onboard the Flying Fortress SE-BAH – 'Sam' – when it landed at Bromma airport on Monday afternoon after the record flight from Addis Ababa. Captain von Rosen sat at the controls of the aircraft, and the plane carried four passengers, and a significant amount of cargo, lots of bananas, amongst other things. Captain von Rosen reported a brilliant flight, mostly in sunshine above clouds. The flight over the Alps, with the peaks rising up to 7,000 metres, was particularly impressive. The plane took off at 4 o’clock in the morning from the airport at Addis Ababa, and arrived after fuel stops in Cairo and Athens, at Naples, where bad weather forced them to spend the night. At seven the next morning they took off again, despite the weather that still had not improved much – during the past three days all air traffic had been cancelled at Naples Airport, and SE-BAH was the first aircraft to get in the air again. After nine hours of non-stop flying, the aircraft finally landed at 17:00 hrs. at Bromma. The journey down south had taken place last Tuesday, and no problems had been reported. The plane had carried 22 passengers, and Captain von Rosen expressed great satisfaction at the welcome they received in Addis Ababa. The Emperor, Haile Selassie, and many members of the diplomatic corps had come to the airport to witness the arrival of SE-BAH, the first four-engined aircraft ever to land at an Ethiopian aerodrome. As a memento of the event, Captain von Rosen handed over to the Emperor, a cigar box from ABA – SILA. Radio contact all the way from Sweden to Khartoum. The day after their arrival, the Imperial couple made an unexpected visit to the airfield to have a closer look at the converted Fortress. Mechanic Hjelm had the honour to demonstrate the machine and its technical finesse. Captain von Rosen described yet another technical accomplishment during this long-haul flight. All the way down to Khartoum, the radio operator of 'Sam', G. [Gunnar]Eriksson, was in radio contact with Sweden. Flight navigation was carried out by astronomical observation. Unfortunately, the Flight Captain [Co-Pilot], Sven Åhblom, had to stay behind in Addis Ababa due to lumbago, but he seemed not too bothered about the misfortune. During the stop in Cairo, on the way back home, Captain von Rosen unexpectedly bumped into his old mechanic from the Dutch airline. The mechanic was now working on the big four-engine aircraft that transport sick Dutch people from Java to Amsterdam. The landing in Naples was complicated in the dark. A horrible thunderstorm was raging, but thanks to the English Military, the plane was guided down, by pointing the headlights to a single illuminated spot, around which 'Sam' was able to descend in a steep serpentine flight path pattern, thus avoiding the high mountain tops around the field. The four passengers on SE-BAH were Mrs Kjerstin Guntenberg with her two sons, and the Norwegian engineer, Ingart Tjomsas, who had joined the flight in Cairo. 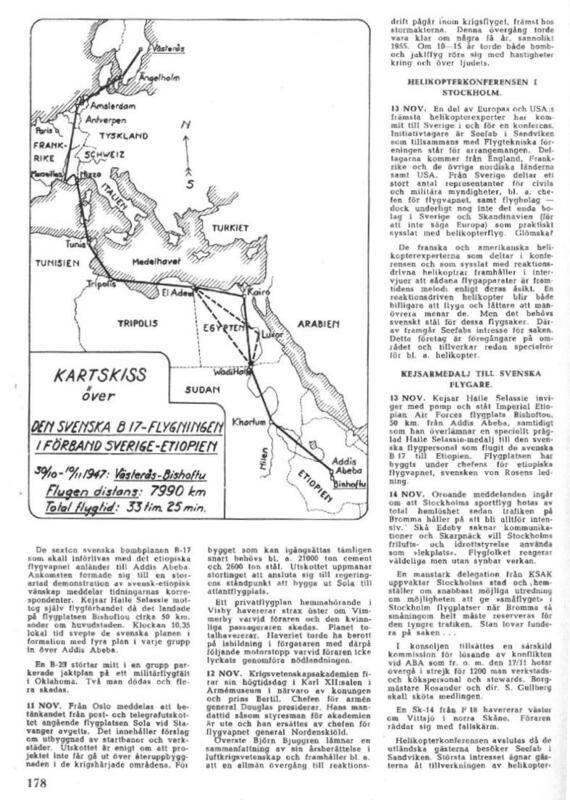 Fru Guntenberg, who with her two sons had boarded the plane in Addis Ababa, told Svenska Dagbladet that she had not been to Sweden since 1939, having accompanied her husband, engineer Uno Guntenberg, to Persia, where he has been leading the construction of a railway line, for the Persian Government. In March this year, her husband was employed by the Ethiopian authorities, and the family relocated from the Persian Capital Teheran to the town of Dire Dawa in Ethiopia. Both her sons were born in Sweden, but have accompanied their parents on their travels, which have given them extraordinary language skills. They speak three languages fluently: English, Persian and Swedish. The picture withh the four mechanics and the Kilimanjaro were from an earlier von Rosen flight with DC-3 SE-BAW, ABA´s "Svanen" to Madagascar. 1945, 11 november: Det nybildade Nordiskt Missionsflyg startar med att en Douglas DC-3 tillhörig ABA gör sin första flygning från Bromma till Madagaskar för att hämta hem norska missionärer. Missionsflygs egen Douglas C-53 Skytrooper inköptes senare från USAAF och registrerades som SE‑APG (se Apostlagärningarna!). Namnet ändrades från "Hay Stack Annie" till det mer lämpliga "Ansgar". Första turen med Ansgar, 5 mars 1946, gick till Dar‑es‑Salaam i Afrika med Carl Gustaf von Rosen som befälhavare. I ”Ett år i luften 1956” har Torild Backe berättat om de nordiska missionssällskapens strävanden att hämta hem eller stödja sina i världen stationerade missionärer som under världskriget varit isolerade från sina hemländer med hjälp bl a av en egen DC-3, ”Ansgar”. 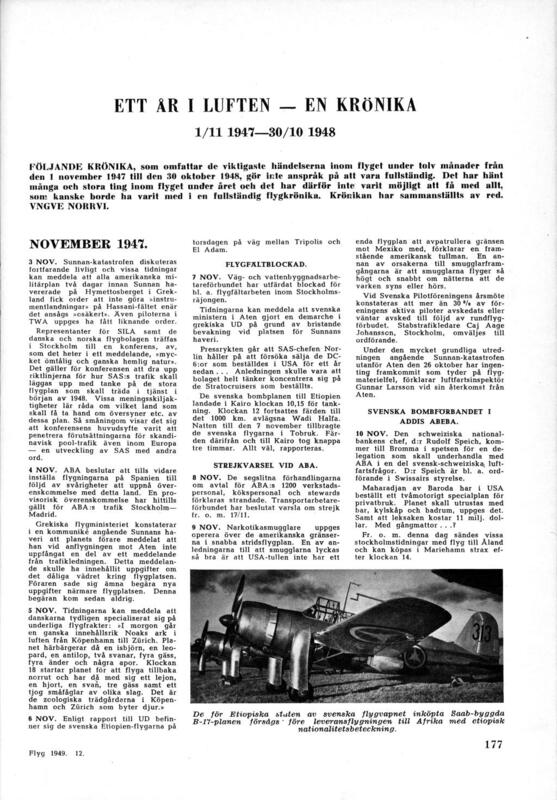 Under tiden november 1945 - april 1950 genomfördes 39 flygningar till Afrika och Asien. 1945, November 11: The newly formed Nordic Missions flight started with a Douglas DC-3 belonging to ABA making its first flight from Bromma to Madagascar to retrieve Norwegian missionaries. Missionsflygs own Douglas C-53 Skytrooper was later purchased from the USAAF and registered as SE-APG (Swedish Acts of the Apostles!). The name was changed from "Hay Stack Annie" to the more appropriate "Ansgar"[The Apostle of the North]. The first trip with Ansgar, March 5, 1946, went to Dar-es-Salaam in Africa with Carl Gustaf von Rosen as commander. 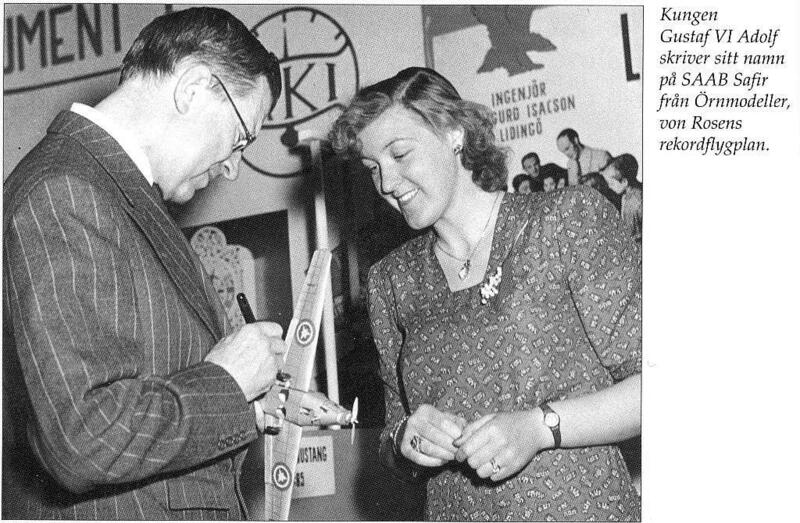 In "One Year in the Air 1956", Torild Backe told of the efforts of the Nordic missionary societies to retrieve or support their missionaries in World War II, who had been isolated from their homeland, by using their own DC-3 "Ansgar". Between November 1945 and April 1950, 39 flights were conducted to Africa and Asia. 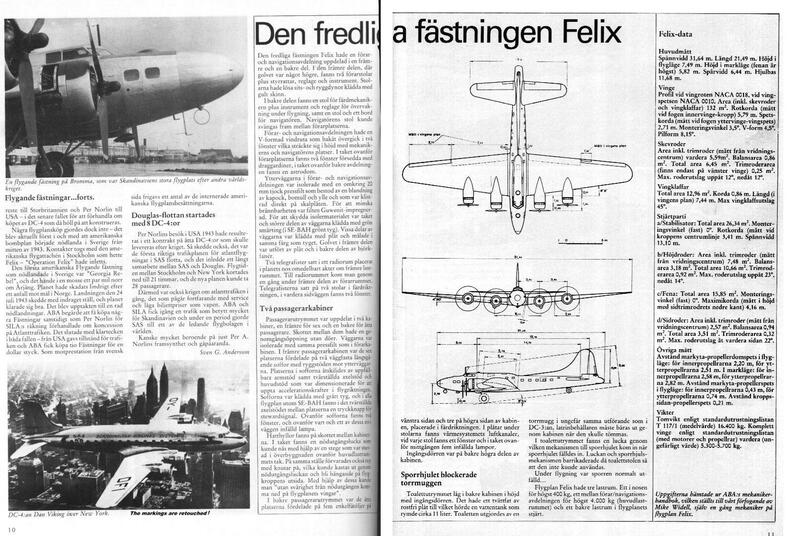 The interior of the "Felix-17" (Saab modification for civil transport) is described in this clipping from the Swedish Aviation magazine MACH, issue 27 (fourth quarter of 1986). The language is Swedish but I hope it could still be of some interest. A detail is that the the tailwheel could not be rectrated when the simple toilet was to be used!